I am old enough to remember when fabricating parts for a race car involved some, if not all, of the following: aluminium sheets, tin snips, pop rivets, self- tapping screws and a flippin’ big hammer. The closest we got to composites was fibre-glass or as they said on Tomorrow’s World, Glass Reinforced Plastic, GRP. Lathes, milling machines and presses did the big stuff and we got oily hands and lost the skin off our knuckles. Time moved on and CAD and CAM arrived, and Spark Eroders and multi axis CNC machines arrived on the scene along with carbon fibre and autoclaves. Touch and finessing by eye and feel were replaced by precision engineering. CAD files were more important than the lump hammer and pry bar. Motor sport moved away from the artisan and the almost cottage industry that it was, into a huge technology-led global business. The pinnacle of each motor sport genre strives for speed and reliability, with the gains made at the peak of the sport cascading down to the grass roots. What was once science fiction, is now motor sport engineering fact, and this is the case with the latest innovation to hit the mass market, 3D printing. Over the last few months, it strikes me that you can’t go a week without hearing about something that has been produced by 3D printing whether it is a ‘bionic’ limb, a gun or a child’s toy. 3D printing seems to be headline news with the technology readily available to the man on the street for as little as £299.99! So what is 3D printing? Well, its technical name is Additive Manufacturing (AM). Unlike traditional methods of manufacturing which involve taking material away, Subtractive Manufacturing (SM) from the solid billet, AM began by laying down photo hardening polymers under UV light, using standard and custom inkjets. This polymer/inkjet technology has had very limited use. However, over the last few years it has been possible to ‘grow’ metal parts using Fused Deposition Modelling (FDM), utilizing mediums such as liquid, powder, plastic, sand, metal even chocolate. The component to be manufactured starts life as a 3D model, this can either be a physical model which is scanned with a 3D scanner to produce a CAD file, or it is produced virtually as a CAD file which is then used to lay down cross sections of the component in layers around half the thickness of a human hair. The substrate can be either a neutral self colour or colours can be introduced during the manufacture to give the desired finished colour. I was invited to visit the Head Quarters of Strakka Racing who compete in the FIA World Endurance Championship (WEC) and the ACO 24-Hours of Le Mans, and who are currently developing an LMP1 car for the 2017 season. I was keen to find out how AM worked for them. It was clear that time and money were the main drivers in the decision to utilise AM. Strakka are clearly experts in their field of race car engineering and see the advantages of working with experts in other fields. 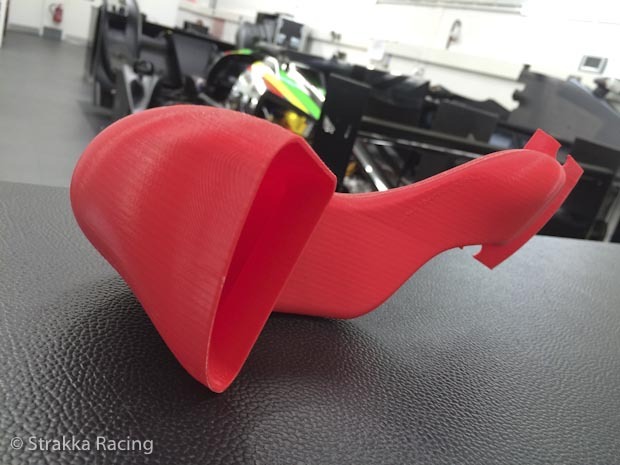 AM is no exception, Strakka work closely with Stratasys to develop their 3D AM capability. Much of what goes on at Strakka is sensitive and I am grateful for the access they afforded me. So, without going into detail for very obvious reasons, Strakka explained that from design to manufacture and fitting the component on the car using carbon composites could take anywhere between 2-6 weeks. AM allows components to be designed and manufactured within one day. The possibilities to test and develop components are immense. Clearly this saves time and money and helps hone the team’s competitive edge. As the saying goes a picture paints a thousand words so what could be better than a video to demonstrate what 3D printing is all about. AM can be used on existing projects. 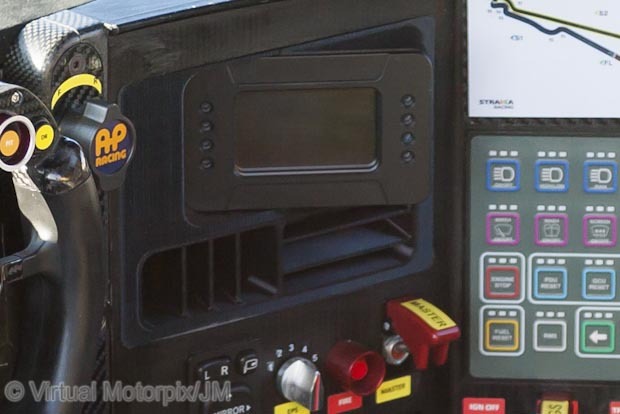 In fact I was given an example where a regulatory change was introduced mid-season requiring the redesign of a component. The problem was identified on Monday, the solution was designed, manufactured and fitted to the car on Wednesday. 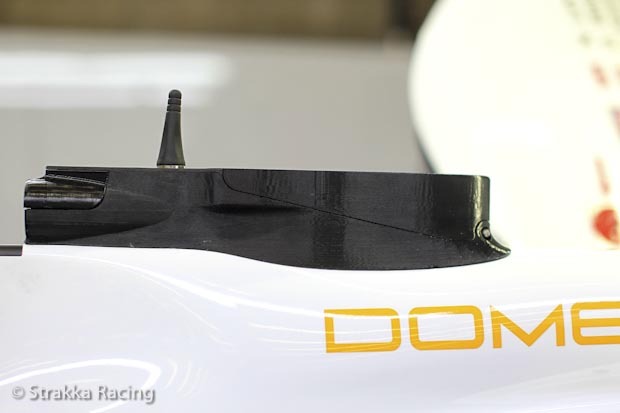 Currently AM is used for items such as aero parts, cooling ducts, cockpit dashboard components and tooling mainly out of FDM Thermoplastic. The real excitement comes in new projects where the engineers are now looking at AM as the basis of the design of the components giving more freedom (of course within the regulations) to use innovative design not only in the race-ready components but the tooling jigs and moulds used to manufacture components which at the moment cannot be produced using AM. As the AM technology grows in part based on the work that teams like Strakka are undertaking, the possibilities for AM are endless and who knows how long it will be before a fully reliable engine or drive train can be produced using AM. I believe that 3D printing is here to stay. It isn’t a consumer gimmick, it has a real place in modern manufacturing.